When it comes to defending your rights and giving you a voice in a court of law, count on Jo. A. Fabrizio, Attorney at Law to ensure your rights are aggressively defended. We understand how to help owners of businesses meet personal and professional goals. Our solutions are innovative and practical. The result is a full range of personalized business planning services. We prepare simple and complex wills and trusts and advise clients on all aspects of estate and asset protection planning. We use sophisticated tax and estate planning techniques to minimize or eliminate federal and state income and estate transfer taxes. Also we practice before the probate courts of the State of New York in all aspects of estate and trust administration, including will contest proceedings and family disputes.As an experienced family law firm, the Law Offices of Jo. A. Fabrizio are familiar with the emotional turmoil of people confronted with divorce, and all issues surrounding the breakup of a marriage. We listen to you as you identify your goals and desired outcomes in the division of assets, spousal support, child support, custody and visitation. The stress and anxiety of attempting to adopt a child and build a family can be overwhelming. For a family looking to grow, there is nothing more important , at Fabrizio Law Offices we understand that. We know just how passionate you are about adoption and we are eager to facilitate the process. 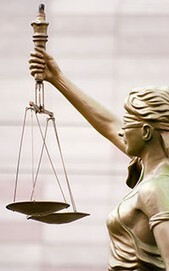 Representations of the Lady of Justice in the Western tradition occur in many places and at many times. She sometimes wears a blindfold, more so in Europe, but more often she appears without one. She usually carries a sword and scales. Almost always draped in flowing robes, mature but not old, no longer commonly known as Themis, she symbolizes the fair and equal administration of the law, without corruption, avarice, prejudice, or favor.